The book is the first ethnographic study of international retirement migration and offers a sometimes surprising picture of the potentials, seductions and limitations of the lifestyles. People envision retirement as freedom from responsibilities through shedding the restrictive shackles of their former selves in a time of life dedicated to fun, friendship, healthy activity and individual fulfillment. However, as Oliver documents, a number of contradictions underpin the pursuits of such a lifestyle. She shows how retirees must balance time-use to achieve both freedoms and busy social schedules -- their activities, their relationships, and their cultural identities – to balance both the security of nationality with the discovery of the new. 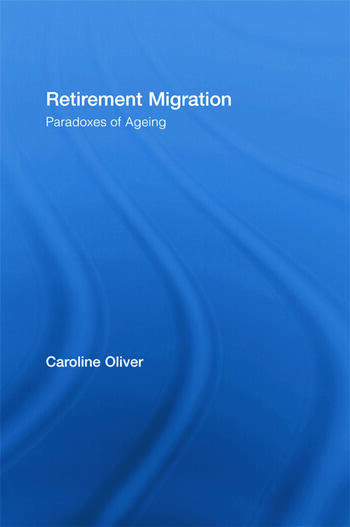 Retirement Migration gives a critical insight into the new ways aging identities are experienced by a growing number of older people in Western societies today. Caroline Oliver is a Senior Researcher at the Centre of Migration, Policy and Society at the University of Oxford. She has worked previously at the University of Cambridge and the University of Newcastle-upon-Tyne, and completed her PhD at the University of Hull, UK.